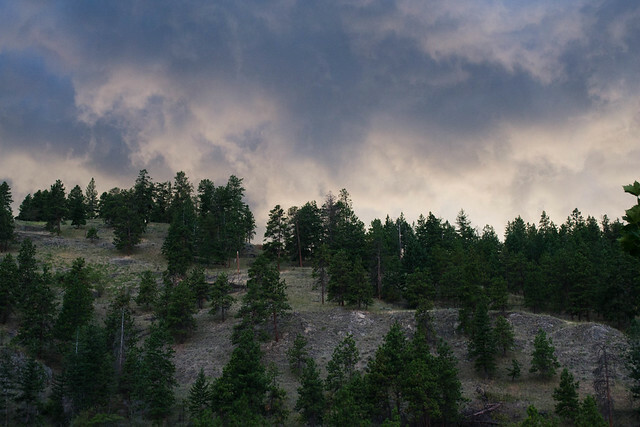 This summer, I had the pleasure of visiting the Okanagan in the interior of British Columbia. Located a 5 hours drive from Vancouver, it is rich in nature, outdoor adventures and delicious foods. I spent three days in the region exploring and tasting everything they had to offer. Here is a little about what we did. 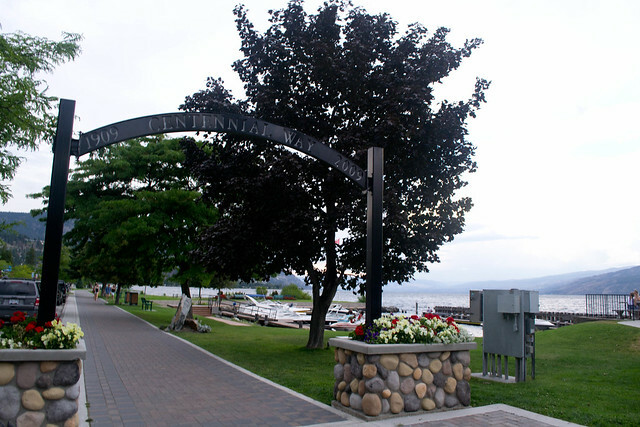 Peachland, located just 30 minutes away from Kelowna, is where we decided to stay. It offers a small water front area with an assortment of restaurants and stores. There is a boardwalk along the water that runs the length of the town. It’s not very long – maybe 4-5 blocks. If you’re looking for food options, head to the Blind Angler Grill. It’s in a little hut that is set right next to the water. Sitting on the balcony is a great place for a meal. It’s so serene and beautiful. But lucky us, we got caught in the middle of a rain storm! Another restaurant is the Gasthaus on the Lake – a German restaurant – which our B&B hosts recommended. But I really didn’t enjoy my meal there. They get really busy in the summer and the whole experience suffered. Along the way we stumbled upon a swimming area complete with a rope swing. Looks like a lot of fun, but just our luck, that day was windy and cold as a storm was brewing. Dare to go for a swing? 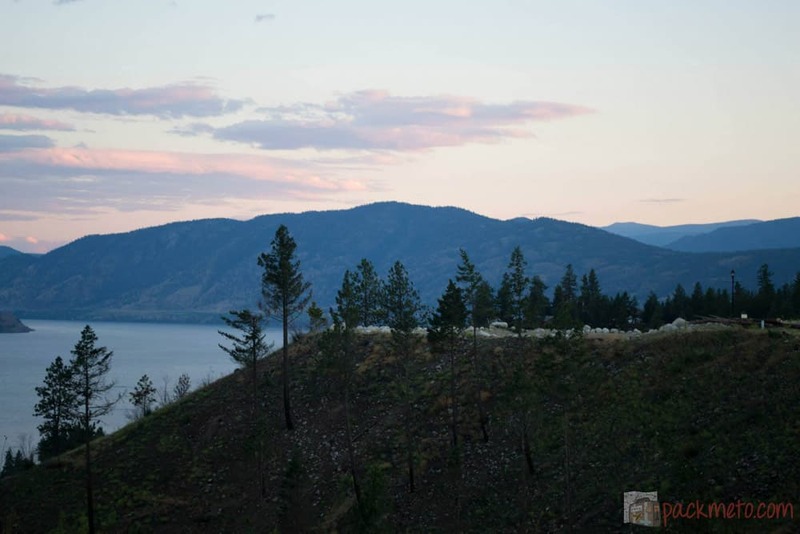 Peachland is also home to Zipzone Adventure Pack, the highest zipline in Canada and one of the highest in the world. I’ve been wanting to go ziplining for ages in spite of not liking heights, but we weren’t able to fit it into our schedule. Next time maybe! Because we booked so late, we couldn’t find accommodation in Kelowna for a reasonable price, we ended up looking elsewhere nearby. In the end I think it worked out for the better. 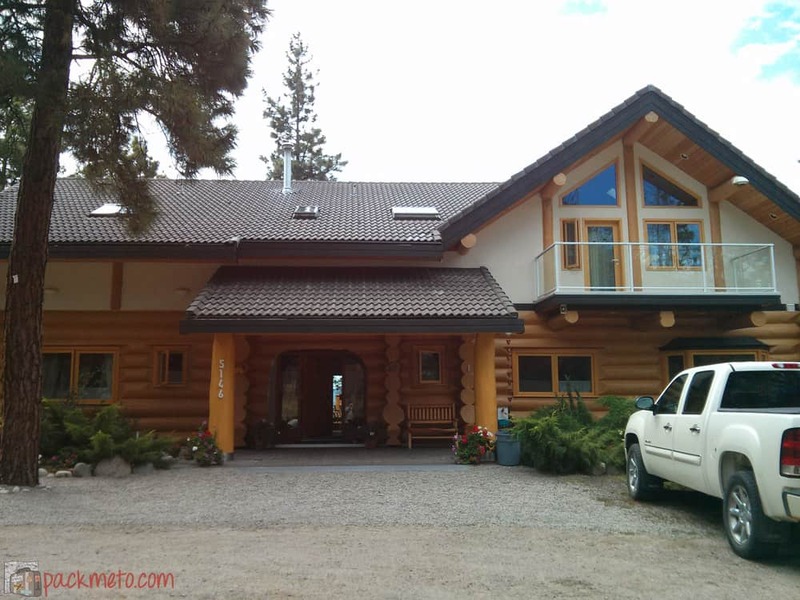 Log Home B&B is located in Peachland, not in the town centre, but rather up on a nearby hill. It has a great view of the lake and the area below. I could get use to waking up to this every morning. The B&B is run by a lovely German couple who immigrated to Canada years ago. They built the cabin which they call home and where the B&B is located. They are really friendly and really want to get to know you. They look a liking to The Boy seeing as he was from Europe and they had fun reminiscing about Germany and discussing the idiosyncrasies (and frustrations) of living in Canada. They have a friendly dog and cat as well, both of whom are accustomed to people coming and going. The served a delicious breakfast – usually more food that you can even eat. I loved everything they gave us because it really reminded me of the breakfasts I had traveling throughout Europe. It was mostly cheese and meats, with one cooked dish, but just the sheer variety of the meats and cheeses had me. They also served bread with delicious jellies which were homemade. So good! 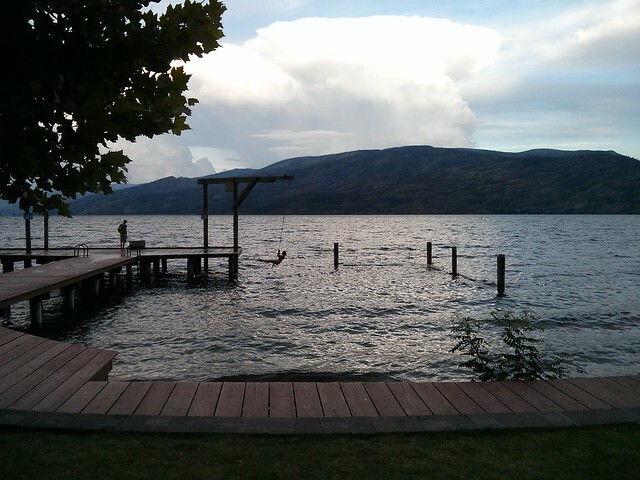 If I’m going back to that area of the Okanagan, I would definitely stay with them again. The best part of visiting the Okanagan? Wineries galore! You pretty much need a couple of weeks in order to visit all of them. There are so many! But at least spend a day or two sipping your way around. Read more about my winery tour. I previously wrote about exploring this feat of engineering so go read the post. While a bit out of the way for most people, I would highly recommend checking it out. It’s so beautiful and quiet and such an unique experience. Makes it totally worth the side trip. The Okanagan has great weather for fruit growing especially in the summer. I love cherries, but dislike the high prices in Vancouver. So we decided to go cherry picking at Arndt Orchards. It was my first time picking cherries and while I was a bit apprehensive climbing up on the ladders (ew heights! ), I eventually got my cherry picking legs and had no problem reaching high up into the trees to get the good stuff.Half way through our picking session we were caught in a freak rain storm. It was actually quite refreshing after the summer heat. 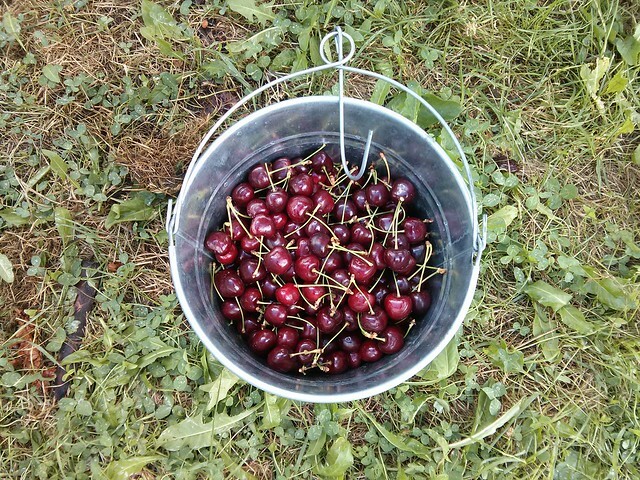 In the end we picked about 22 pounds of cherries (two of those buckets above full to the brim!) which I divided up among family, friends and my freezer. Summer cherries in the midst of the cold and snow Vancouver is currently under? Yes please! 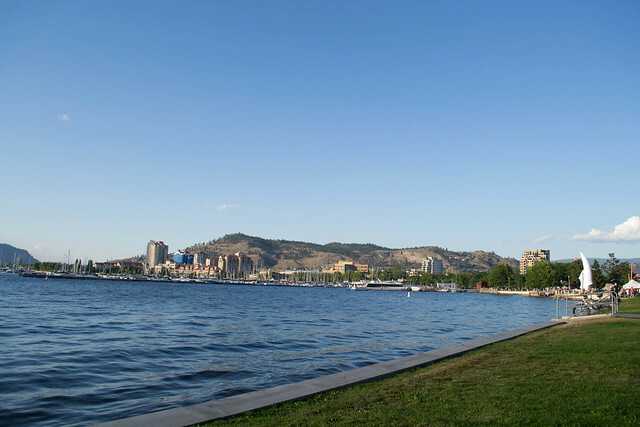 Kelowna is the largest city in the Central Okanagan region. I have a couple friends who are from here, but I had never been. We explored a bit of the downtown area of the city. The waterfront is really pretty – full of parks and benches to enjoy the gorgeous weather. Grab an ice cream in a nearby shop and go for a walk along the water. 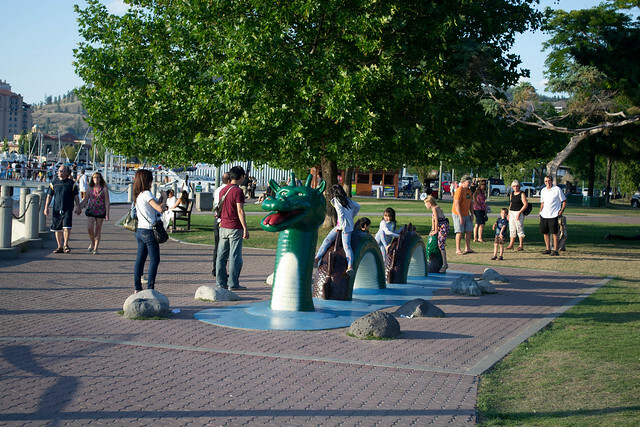 We got in touch with the ogopogo which is the resident serpent-like water monster of Lake Okanagan. Think the Loch Ness Monster but Canadian. The First Nations people have reported sightings of this multi-humped monster of 40 to 50 ft since the 19th century. Who will win the tug-o-war? While we didn’t see him in the lake, we did see a lot of fish! Gigantic ones! So certainly the ogopogo won’t go hungry. Lake Okanagan is huge. You can see across it from east to west, but you can’t from north to south. There are a variety of water activities that you can take part in. On our last day, we ended up renting some kayaks from Peachland Beach Rentals. They also offer paddle board rentals, and a variety of bikes. They’re a little hard to find, but were really helpful despite how many times I had to call them! I’ve been wanting to try paddle boarding, but seeing as we had a long car journey home, I decided to forgo that in case I ended up going swimming. We paddled around the lake in our kayaks, following the shores of the lake. It was a hot day so getting to dip my hands into the water every so often to cool off was really nice. Thankfully we both made it out of the kayaks without taking a swim. A win in my books. I wish I took a photo, but I was too scared of getting it wet that it stayed firmly on dry land. So there you have it. 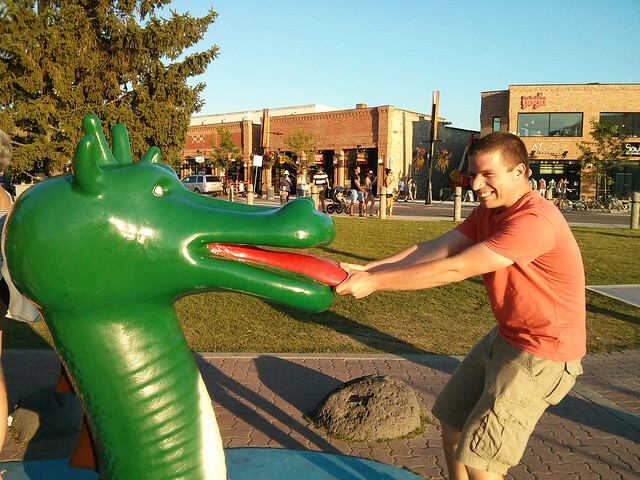 My whirlwind tour of the central Okanagan region. Driving from Vancouver is fairly easy with the highway. You start off on Hwy 1 before connecting to Hwy 5 and then Hwy 97C. However, be careful of freak rain storms. We got caught in one on the way there and we could barely see a foot in front of the car. You can also fly from Vancouver to Kelowna. It’s best if you have a car to get around. Without it, you’re limited to bus service which I know they have, but didn’t use. If you want to go tour wineries and don’t have a car, you can always sign up for a tour. The summer is the best time to go – lots of things to see and do outside with great weather. Just remember to book early so you’re not stuck emailing place after place like I was. Pack sunscreen! And a hat. It gets HOT in the summer. Have you been to the Okanagan? What would you recommend I do the next time I’m there? Stay on top of the fun by connecting on Facebook and following me on Twitter & Instagram. You said world wind… I am tired from thinking about all of these activities. What a cool place to visit.